My family has somewhat of an obsession with almond flavored foods. Breads, cheesecake, cookies…we find a way to sneak into all sorts of baked goods. 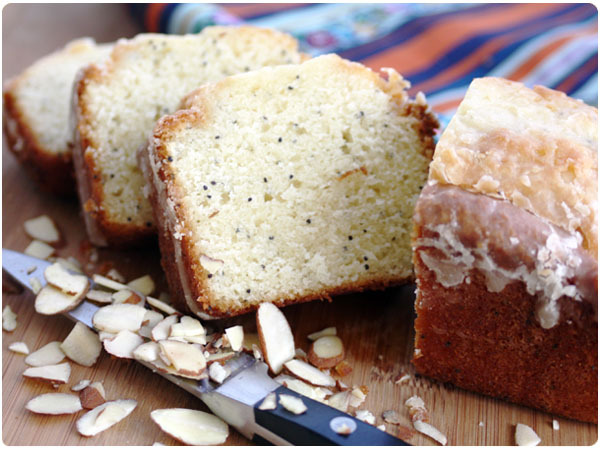 This easy quick bread recipe lets almond be the star and can satisfy a morning sweet tooth or could even be served as a simple dessert. The mini loaves make a great gift for friends as well. Preheat oven to 350. In a large bowl, combine flour, sugar, salt, baking powder and poppyseeds with a whisk. Beat in milk, almond and vanilla. Beat in vegetable oil. Beat in eggs and mix well, for approximately 2 minutes. Pour batter into two greased loaf pans or 4-5 mini loaf pans. Bake regular loaves for 60-65 min or mini loaves for about 45 min. Let cool. In a small bowl, whisk together all ingredients. Drizzle glaze over top of loaves and let set for at least 1 hour before cutting. Loaves can be wrapped in foil and placed in a zipper freezer bag and frozen if you don’t plan on eating them within a day or so. It looks so moist and delicious. My husband’s a big almond dessert lover too. mmm sounds like an amazing flavor combo!! That looks amazing. 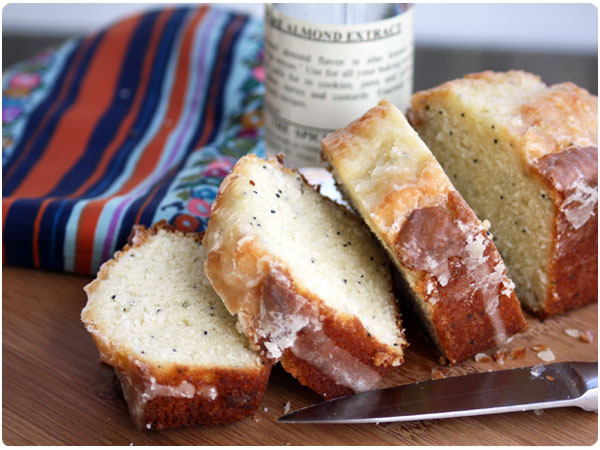 I had an elderly neighbor growing up that always made us poppyseed cake and this looks just like it, but even better with the almond flavor! Just made this and tasted it, This is absolutely amazing! I made mine into 2 full size loaves and cooked them for 65 minutes for them to be done on the tester. Simple and Wonderful, I wouldn’t change a thing.